How I met Honey Doe Farm is actually a much more interesting story than one might think. Though I had, from time to time, seen their advertisements online, I had not yet had a chance to visit their farm, which was only about twenty miles from our then home. When another goat friend decided to go see what they had available, I hitched a ride, and we drove up to check it out. I was surprised to find such a beautiful farm tucked away along the highway, hidden from plain sight and pretty much a complete unknown to the local goat community. Even better, as the sweet and friendly owners described their method of care, I was impressed to hear that they were up to date on the latest in goat maintenance. The herd was made up of Nigerian Dwarves, my breed of choice, and some funny earless critters I knew to be La Mancha goats. I’d not yet seen one in person, and at first I thought they were rather off balance, but as they swarmed around me to be patted, I had a newfound appreciation. Especially since the Nigerian Dwarf members of the herd only stared at me suspiciously. Now I had quite the problem! There was an entire herd of Nigerian Dwarves in front of me – and I wanted one! But I hadn’t thought to bring any money. Thinking quickly, I offered to make the farm owners a website in exchange for a doe – after all, it was a shame that no one knew this nice little herd was here. They accepted, pleased with the idea, and I picked out a little golden doe named Cinder. 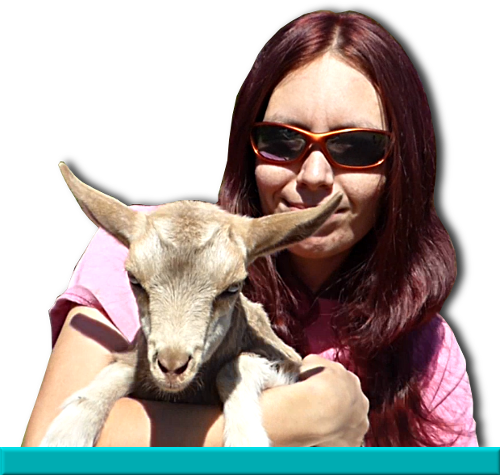 Unfortunately, Cinder ended up being sterile, and when the website came up for renewal, I returned to Honey Doe Farm and picked out a replacement – a lovely red and white Nigerian Dwarf doe, and a cute little golden Mini Mancha in exchange for another year of hosting. Upon returning home, I secured the now screaming newcomers in a small pen, and went inside for a nap. I woke up later and immediately realized it was entirely too quiet. I had left the shelter (a large dog house) too close to the fence, and my new goats were gone. Great, I thought. Just great. I grabbed a feed pail and went searching. A couple hours later I came back, retrieved my pony, and expanded the hunt. By nightfall, I had to call it quits with no luck. I sent an embarrassed email to Honey Doe Farm, describing how I’d managed to lose the goats in rather record time. Immediately they responded, offering to come help me look. I was very grateful, and that next morning they arrived, toting a border collie alongside, and we set out searching. During this time, I got to know both owners better, and we traded stories as we trekked through pastures and along roadways. They told me about their plans for the near future, plans to build a dairy and make cheese. They even promised to bring some along next time. We didn’t find the goats that day, but we persisted. During one evening, putting up posters, they asked if I would be interested in helping butcher some turkeys in exchange for one. Well of course! I’d seen their big fat delicious looking turkeys, and it happens to be my favorite bird to eat. Just three days after the disappearance of the two runaways, I received a phone call from a lovely family a mile down the road. Their dog had cornered a little goat in their shed, and that morning they had seen my post at the feed store. It turned out to be the Nigerian Dwarf doe, who earned the name Gypsy for her wandering ways. I took her home gratefully, and she stayed in the pen this time. One of her daughters still resides in our herd – K-N-S Farm Catnip. Unfortunately there was no sign of the little golden Mini La Mancha, and as the days went by, my hopes of finding her dropped lower and lower. It was very likely she had been killed or died somewhere, and I pretty much chalked her up to a loss; an easily preventable loss that I had caused by one silly little mistake. Ah well – we are all harder on ourselves than we should be. During this time, I did indeed help with a group of turkeys and took home one for myself, along with some ground turkey as a bonus. It was the best tasting turkey we’d ever had. They also shared some smoked queso fresco with us – so delicious my husband and I fought over it. As we continued to visit and help out, more invitations to come and work came. The farm owners were not put-off by my inability to drive – “Why, it’s not that far at all! We’ll come get you.” and were always very interested in hearing the latest in goat news. One day I pointed out several just beautiful Nigerian Dwarf kids and mentioned I could probably get those sold for them if they wanted – I had by now been dabbling quite often in “brokering” goats (selling for people and earning a commission on the sale) and had a fairly good grasp on the market. We quickly came to an agreement, and I toted home a crateful of kids that I disbudded, broke to the bottle, and sent to new homes. Two weeks after going missing, Yumi the golden Mini La Mancha was found on the side of the road ten miles away. A friendly chicken farmer picked her up and brought her home, and later saw my now faded and tattered flyer on the Post Office bulletin board. They never ran away again. The definition of “expert” is having or involving authoritative knowledge of a subject. Often times it’s not a self-described trait, but one placed upon you by your peers. Dr. Anders Ericsson says that it takes ten thousand hours, or twenty hours a week, fifty weeks a year, for ten years, to become an expert in a field. For some, it’s a label they put on themselves at the first opportunity. Perhaps out of arrogance, perhaps from ignorance, perhaps out of insecurity. Most people who have known me a good long time know that I was not always the goat person. Before goats, I handled, bred, exhibited, and kept many species, ranging from exotic mammals including deer and wolves, to slithering scaly or slimy cold blooded animals, be they frogs, turtles, or snakes. I have always been grounded in the animal world and I am extremely fortunate to have gained experience and knowledge on a wide range of life before I finally “settled down” to become a goat enthusiast. Since then, I have been only digging myself deeper into the world, turning it from a hobby into my literal employment. I am with goats more often than I am with my husband. I now fit the definition of a goat expert by most accounts, but I always get rather amused with myself anytime a situation needs me to actually present myself as such. While I am not foolish enough to deny that I have gained a great deal of knowledge about goats, I am also not quite conceited enough to believe that I know it all. In fact, I’m one hundred percent certain I don’t even come close to knowing everything about goats; there is not a season that goes by where I don’t learn more. Every kidding season brings a unique birth I haven’t had before. Every message sent to me has the potential to be a problem I’ve yet to handle. Every day brings a brand new opportunity to learn. While there are several ailments I have a good working knowledge of, I have no hands on experience of them yet, which is often the most valuable part of learning and where one gains confidence in a situation. Where I may be strong in some areas, there are others who may be stronger, and there are areas where I am weak in knowledge where I depend on the experiences of others. Which is why the phenomenon of the “Overnight Expert” can be such a potentially dangerous thing. Not unique to the goat world in the least, an Overnight Expert is someone who comes into a hobby, and after a relatively short period within, begins to dole out and dispense advice alongside the veterans of their community. Much of what they tell others is parroted from their own mentors or sources, which in itself is harmless enough, despite the lack of solid understanding behind the given. It’s often driven by a desire to prove oneself in their community, and I can certainly empathize with the desire to be a part of the group. It rarely comes from malicious roots, and is often unintentional by the person in question. These folks are just seeking to share and help, and there’s nothing untoward about it, as it’s merely a facet of human nature. These are our friends we must show patience and positivity to, as we continue to guide them along the path. More than one of these innocent and unknowing Overnight Experts has gone on to take the title legitimately, because of those who supported them. We do no one a favor when we drive away the new members of our community for overstepping the invisible understood boundaries. Patience, patience, patience. However, the range of Overnight Experts, as with all things, does include those who do far more damage than good. These are the folks who twist their limited knowledge to spread misinformation, speak over those who should be speaking, and drive away others with a sour high horse attitude. You’ve all met at least one, if you’ve spent any length of time in a community. When they spread misinformation, it hurts those new to our community the worst, because they know no better. We so often believe things we read on the Internet or are told to us with no concrete evidence of the claims. We are subconsciously thinking the best of those who appear to be helping us, leading us to not question what we’re told. One of these was a claim by a group of “young” goat keepers that CAE (Caprine Arthritis Encephalitis) was not “as bad” as the older generation claimed, that the “hysteria” surrounding it was unfounded. They went on the claim that it was cruel to cull infected animals, and that CAE infected milk had potential benefits. That “most animals are asymptomatic anyway” – I am being very broad here, and they had their reasons to back up their thoughts, some of which are even worth a second look. But the truly cruel thing here is any defense of a disease that causes our beloved animals terrible pain. Yes, some animals are asymptomatic throughout their lifetime, but how could one even begin to consider the risk of perpetuating such an awful preventable disease in any fashion. I have seen what the effects of CAE can be. I am not hysterical about the disease, nor do I consider it always a death sentence, but this is something that breeders before me have taken immense steps to control and eliminate. To speak so callously against the great work they did is, quite frankly, insulting in my opinion. There is nothing I appreciate more than those that do and did the work that I benefit from now. Regardless, this blog post is certainly not about that discussion, and both sides have valid thoughts. Where the problem lies is when that way of thinking is marketed straight to a professional looking website or blog, forum or Facebook, paraded as fact from a truly experienced source. Where newcomers to our community read it and begin to think that they don’t need to test their herds. That CAE will not harm their animals. This is only one large example in a sea of misinformation surrounding our funny little caprine friends. In the end, it really depends on you to do your research. Don’t take anyone at their word – and don’t forget as well, what works for one farm may not work for another. It doesn’t make one farm wrong and one right. Ask ten breeders a question and you might get fifteen answers – all of them right in their own way! We’re all in this together, and our community has room for all of us.